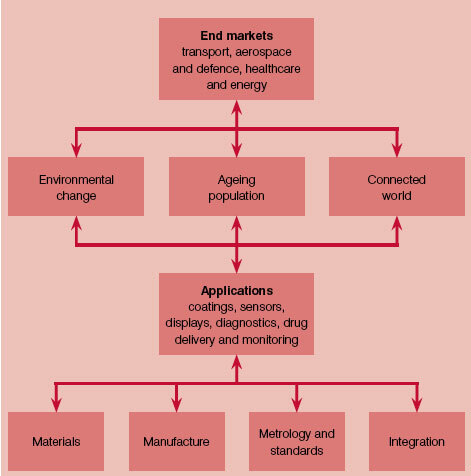 (Nanowerk News) The UK's Technology Strategy Board has developed a nanotechnology strategy document that sets out the processes the Technology Strategy Board will use to determine how it will invest in the nanotechnology space in a way that helps UK businesses to succeed on a global scale. It is based on the fundamental premise that the technologies likely to see the most success will be those that result in developing materials and devices with new functionality that address markets driven by society’s greatest challenges. monitoring structures and waste streams. next-generation computing and entertainment systems. A technology-inspired strategy focusing on three challenge areas. invest in technologies that have strong potential to address market needs that are driven by society’s greatest challenges. invest only in those activities that recognize the need for sustainable development.